Essential reading for lovers of Victorian true-crime stories. The book takes readers on a roller-coaster ride through Britain, France and Monaco in the company of one of the greatest swindlers of the era as he pulls off one breath-taking coup after another. His amazing win at Monte Carlo is just one of many highlights in this true story, which reaches a climax when Wells is pursued across Europe in one of the biggest man-hunts of all time. Order now: Amazon, Waterstones, WHSmiths, iTunes. Read excerpts on Google Books. In 1891, during two visits to the Casino at Monte Carlo, Charles Deville Wells broke the bank several times and won £60,000 (equivalent to £6 million today). The present owners of the Casino admit that his success has never been satisfactorily explained. In ‘The Man Who Broke the Bank at Monte Carlo’, author Robin Quinn sets out the possibilities . To ‘break the bank’ means to clean out the cash reserve of the gambling table in question. Each table was stocked with 100,000 francs in cash at the start of each day. If a player ‘broke the bank’, that table was temporarily closed and was covered with a black cloth. 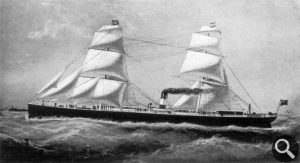 Soon after he broke the bank, Charles Deville Wells bought an old cargo ship, the Tycho Brahe, and converted her into a luxury yacht, re-naming her Palais Royal. At 291 feet in length, the vessel was one of the largest pleasure craft in the world. Even today, she would be in the top-50 of yachts in terms of size. After Charles Wells broke the bank in 1891, his exploits inspired composer Fred Gilbert to write a song entitled – naturally – The Man Who broke the Bank at Monte Carlo. This became the hit song of a generation and remained popular for well over half a century. The singer most closely associated with it, Charles Coborn, made at least five separate records featuring the tune, and once said he had performed it on stage a quarter of a million times. This article from the London Evening Standard of 18 July 1891 caught my eye. (From our correspondent ) Vienna, Friday Night. The question of trailing dresses, treated recently in letters to The Standard, has also engaged the attention of the Supreme Sanitary Board of Vienna. All the District Police Commissioners were the other day officially asked their opinion as to whether dresses sweeping in the mud are injurious to the public health; and whether, if forbidden, the prohibition could be enforced. The replies were handed in to-day, and differ widely as to the possibility of carrying out any such prohibition. One official suggests the imposition of a special tax on trailing dresses, but the inventor of this happy idea admits that the impost would be rather difficult of collection. One of George Meredith’s* sons is an electric engineer, and his latest bit of work is interesting for more reasons than one. This is nothing less than the electric lighting of Carlow, the big village of 6,000 inhabitants which has just dug its impress deep in latter-day political history. It is a good big jump from oil to electricity, from the middle ages to fin de siècle civilisation. I understand that young Mr. Meredith’s firm has many more similar ideas for the conversion of waste water power in Ireland to the purposes of electric lighting. As an inventor and engineer, Charles Deville Wells followed these developments with interest. Among his patents were an improved arc lamp; electric baths; an incandescent lamp; globes for electric arc lamps; electric locks, bolts etc. ; electric apparatus for clocks; and galvanic batteries. A young man, giving the name of Charles Stuart, was charged at Bow Street last week with unlawfully pretending and professing to tell fortunes by handwriting and other means with intent to defraud. … [the prisoner] denied that he was a fortune-teller, but described himself as “a graphologist”. Letters were seized, amongst them being a number addressed to “Professor Huxley” of 28 Church Road, Acton. These were chiefly from females, all containing stamps. 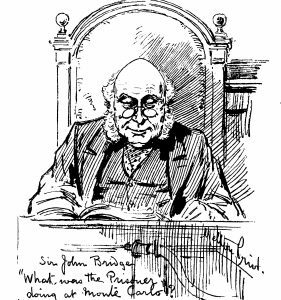 Sir John Bridge* remanded the accused. *Sir John Bridge was the chief magistrate for London. And before long Charles Wells (the man who broke the bank) would appear before Sir John at Bow Street Court charged with crimes much more serious than fortune-telling. The German Emperor arrived at South Leith Station from London at five minutes past seven yesterday morning. The station platform was covered with crimson cloth, and there was a good display of bunting … The Emperor, alighting from the train, shook hands with the Consul and others. He then stepped into one of the four carriages which were in waiting for the party, and drove through the Albert Dock, the people cheering as he passed along. At the north side of the dock were a steam launch and two boats from the Hohenzollern. The Emperor and party boarded one of the boats, which was rowed down the harbour amid the cheers of the crowd, and a steam launch and other boats following, and embarked on board the Hohenzollern. At that very moment, Charles Deville Wells – soon to gain fame as the man who broke the bank at Monte Carlo – was preparing to purchase his own yacht, Palais Royal, which at almost 300 feet in length was even larger than the Emperor’s imposing craft, Hohenzollern. For a novelist writing a work of fiction in a familiar setting and era, the amount of research needed may be minimal – or even non-existent. But for writers of non-fiction, especially history, a great deal of in-depth research is usually required. It’s the foundation on which the narrative is built, and runs through the text like blood through an artery. When pursuing a line of research, I usually go considerably further than the book itself dictates: for example, in my new work, The Man who Broke the Bank at Monte Carlo, an individual named Zalma Bradley Lee has only a fairly minor part to play in the story as a whole and appears on just three or four pages. But I pushed the fact-finding process as far as it would go, in order to have the fullest possible understanding of what this person was like, and how she may have influenced the central members of the cast of characters and interacted with them. In the event, I used probably only ten per cent of the information I had collected on Zalma but the in-depth research helped to explain certain otherwise inexplicable episodes in the lives of Charles Wells – the man who broke the bank – and his French mistress, Jeannette (who had once been Zalma’s maid, and who was later a governess to her daughter). As I don’t possess Flaubert’s poetical turn of phrase, (!) I might not have expressed the sentiment in those exact words but I agree wholeheartedly with what he says. The research for a book is like a giant jigsaw puzzle. With any luck the writer will find most of the pieces of the puzzle and will discover how they fit together. He or she will have to take an educated guess when it comes to missing pieces of the story, and hope that there will not be too many of these. The finished book may focus on a small section somewhere in the middle of the picture – but often it is the surrounding material that gives context, and aids our understanding of the core facts . And where hard information is missing, it is this peripheral knowledge that helps us to formulate hypothetical scenarios when some of the facts are obscure or not known at all. Just as an astronomer needs to have some understanding of the distant parts of the universe to be reasonably certain of how our own solar system functions, the writer needs at least a partial knowledge of the more obscure facts at the periphery of the subject in order to have a reliable understanding of the information at its heart.